Bet on Cash4Life and you could win £1,000 every single day for the rest of your life. Second prize is £1,000 every month for the rest of your life! How does betting on Cash4Life work? Cash4Life is based on the Cash4Life New York Lottery. Instead of entering the official Cash4Life New York Lottery draw, you place a bet on the outcome and the results of it can be found here. 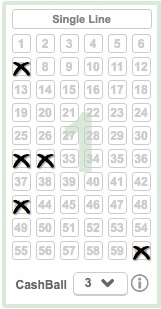 You pick the numbers you think will be drawn in the same way as if you had entered the official lottery draw. The amount of money that you win is determined by the amount of numbers that you correctly guess. Choose 5 numbers from a main pool of 1–60 and a further 'Cash Ball' from a pool of 1–4. You can also select the QuickPick option (Quick+1) and this will choose your numbers for you. Once you have chosen your numbers, select which draw you want to bet on, either Tuesday or Friday. Press ‘Submit’ and this will take you to the cart – at this stage just click 'Confirm and proceed' to place your bet. You will win our jackpot if your 5 main numbers and Cash Ball are the same as those drawn in the official New York Cash4Life draw. A single line bet costs £2.50. Is DoubleJackpot available on this draw? The DoubleJackpot feature is not available on this draw. The top prize is £1,000 a day for the rest of your life. The draw takes place at 2am on Tuesdays and Fridays GMT. The odds of winning the top prize are 1 in 21,846,048. A breakdown of all the odds for each prize tier, together with estimated returns is included below. 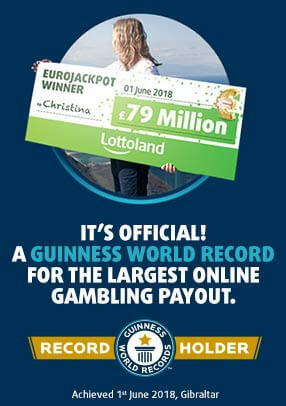 Lottoland is licensed and regulated by the UK Gambling Commission for customers in Great Britain. Why should I bet on Cash4Life at Lottoland? Winning £1,000 a day for the rest of your life is a truly amazing top prize, plus the winning odds of just over 1 in 21 million are more attractive than those available on the vast majority of lotteries. In addition to the this the second prize is £1,000 a month for life. On top of all this it costs just £2.50 for a single line bet.